Ohhhhh. Today’s post is a woozy doozy. I’m giving away a box of sweet, succulent peaches to one of you! Well… I’m not actually giving them away — Frog Hollow Farms is doing it, but I’m taking all the credit. Because I can. They don’t get to look at this post first – haha! 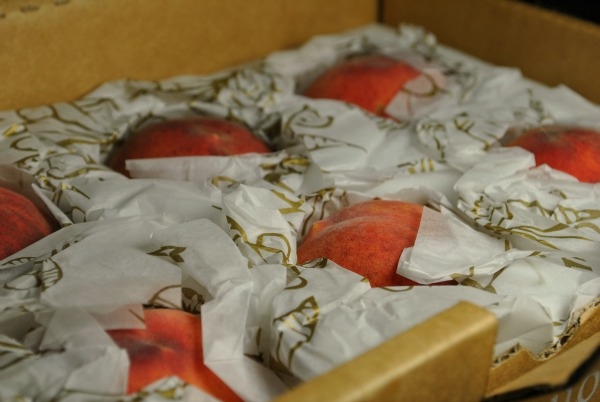 Fast forward a week and I received ANOTHER box of gorgeous peaches. 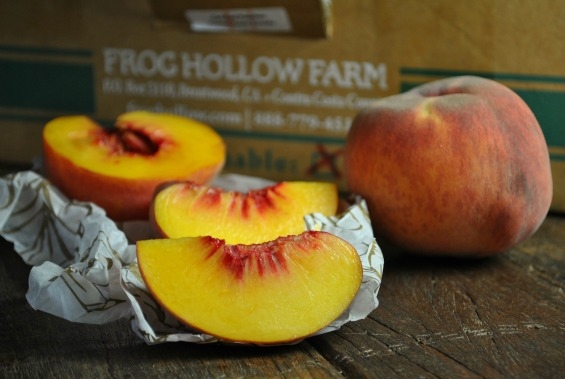 This time they were Cal-Red Peaches and were noted as Frog Hollow Farm’s signature peach. Well hello! I got out both boxes that very hour and started eating. Hilariously the O’Henry peaches were my favorite of the two and were even better than the last time I’d had them. They were a little more assertive and acidic and completely won me over (the flavor was far more complex and exciting than last time), where the Cal-Reds had a deep sweetness that hung around my mouth with little acidity. While they didn’t end up being the winner in my personal taste test, I can see why they would be a signature. I liked them so much that I asked Frog Hollow Farms if they would be willing to send a box to one of my readers. They replied with a super quick YES. So now you can have your very own box of six Frog Hollow peaches delivered right to your door. Just leave a comment and tell me about the best peach you’ve ever had! I’ll do a random drawing on Wednesday, August 21, at 12:00pm PT. I’ll contact you by email and work out the details. Enjoy! Dusty, fuzzy skin with a mix of reds and browns and hints of yellow. Bright sunny yellow flesh and deep red center. Strong, floral and sweet peach fragrance once cut. The flesh is absolutely perfect. Exactly what you want a peach to be – dense and soft with so much juice that you are slurping and cooing the whole time. The skin was noticeable and I ended up cutting it off. Not bad in any way, just a little distracting with a dry mouth-feel. Layers and layers of sweet peachy-ness. Fantastic peach if you prefer the low-acid type. You can also learn a little more about peach types in this goofy video I did on peaches over here and see one that is shaped like a heart, the Desert Gold. But don’t forget to leave a comment here first so you can win! These look delicious and I would love to sink my teeth into one. I love white peaches! Specially when they are still firm and crisp! Fan of yours on Facebook! Would love to try! I had a pretty perfect peach the other day. I don’t know the variety, but it was divine — organic, slightly on the firm side with smooth flesh and a bright, warm juice, and with a skin that was fine and downy, rather than fully fuzzy. Need to get back to the co-op! Oddly enough, the best peach I’ve ever tasted came from Frog Hollow Farms. A friend was raving about them after a visit to San Francisco, and I had to know more. I ordered a box of peaches from Frog Hollow, and what I received was stunning. It was run-down-your-face juicy and remarkably sweet. I had to eat it over the sink. I loved the peaches so much that I ordered the plums, pluots, and nectarines. And then I subscribed to a monthly program. So I know what you’re talking about, sister. We love Frog Hollow at my office, I buy a bagful weekly at the Tuesday Farmer’s Market! I want these!!! The best peach I’ve ever had was actually a Frog Hollow beauty while up in SF. I don’t know the variety but it was to die for! Best peach I ever had was picked right off the tree at the Purdue Hort farm. Having only ever eaten supermarket peaches, I never knew a peach could taste that good. Back in Cleveland, the big local peach orchard is Spielberg’s. They grow Flaming Fury peaches, which are big and pretty, although I can’t attest to the taste. But the name! I love peaches. I don’t get very many, but I would have to say that the best peach I have ever had was purchased at a roadside stand on a road trip through the Yakima Valley. Sadly, I do not know the type, but it was dripping sweet deliciousness on a hot and hungry day! I haven’t had a really good peach in years. When I was growing up we got these wonderful peaches from the Jurgensen’s in La Jolla. I don’t know the variety but I have fond memories of them . Besides the peach I had for lunch? The ones I ate visiting my sister in Oregon 2 summers ago. Don’t know the variety, but they were huge and delicious both fresh and in a cobbler! Love me some peaches. Frest fruit in the mail. Almost as good as phone calls I don’t have to answer! Honestly, I’m more of a nectarine fan. The fuzz kinda gets to me. Perhaps I can be swayed by a signature peach, who knows! 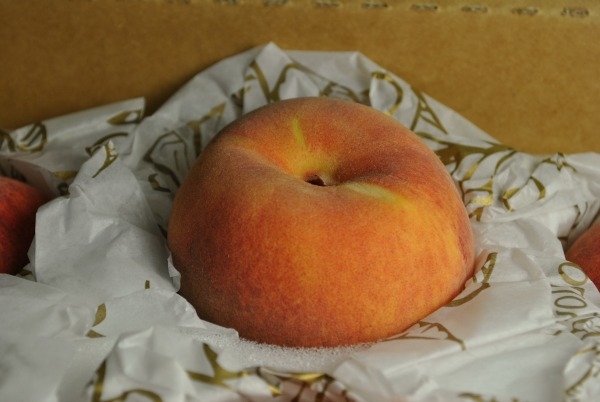 A few months ago I got a few donut peaches from my CSA box, Ive never had one of those before and they were delicious! I can’t wait to get my box delivered tomorrow! Cal Reds are my favorite peach. Frog Hollow has the best peaches. The ones I got from them earlier this summer were sweet, juicy, and had just a little bit of a tang to them. Yum! And the winner is Bob Thomson!!!! WOO HOO. Confetti! Juicy peaches dripping on everyone! OR at least on Bob! I’ll contact you shortly Bob to get your info. Dang – shoulda commented earlier. What I want to know is would they come to our Market? Murray just pulled up stakes, and the people down here are pretty attached to their stone fruit. I would have to say my favorite right now are the Elberta. They are so versatile and because I love to can ( these are one of my favorite fruits), these are perfect for canning. So nice to be able to whip open a jar during the winter and use them to make a melt in your mouth warm gooey goodness of peach cobble, crisp, and peach preserves. I have not eaten a peach I didn’t like yet and always looking for new ones (well new to me) to try. ha ha… guess I am really late on this give away (5 months) but I feel compelled to tell you that the best peach I ever had was a white peach…I think a white queen, but we had a super peach year a few years back and that is probably what made it so good. I don’t no if you are still doing this contest,( being 2 years later.) But I have never had a better peach then the Fredericksburg Texas peach. I have tried Washington states peach, and the Georgia peach, I’ve had the white peach to, don’t remember where its from. But I will give your frog hollow peach a try.